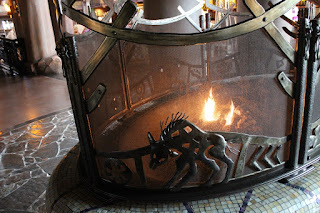 As you make your way through Jambo House, the lobby of Disney’s Animal Kingdom Lodge, you’ve likely passed by Ogun’s Fire Pit on your way to Boma, your room in either the Kudu or Zebra trails, or Arusha Rock. 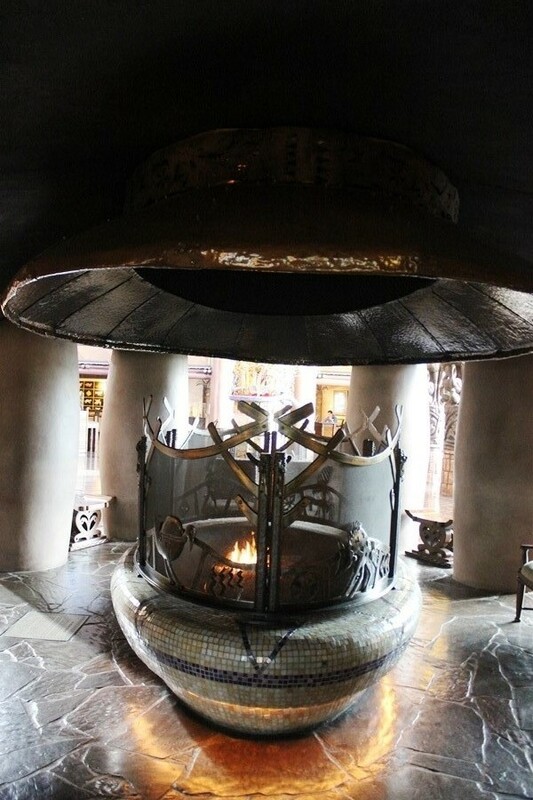 The indoor fire pit is a great spot to start or end your daily adventures, but there is more to this fireplace than just a warm place and some comfortable chairs. Let’s start with its name, Ogun’s Fire Pit. In African folklore Ogun is a great spirit with two primary functions. Primarily he is a craftsman who works with metal to make the earth a better place for people to live in. Ogun is also a great warrior. It is his skill as a metalworker, however, that informs the ornate grate around the fire pit. The metal screen is actually another piece of African folklore and tells a complete story through its embellishments. Now, you could try to decipher the narrative for yourself, and probably come up with some intriguing stories to tell, but there is an easier way. Imbedded in the floor right next to Ogun’s Fire Pit is a bronze plaque which offers up the entire story. A poor man traveling across Africa kindly shared his millet with a weaverbird. He gave a passing hyena some meat. With a buzzing bee, he shared his honey, and to a crocodile, he gave water. A wealthy king set the man four difficult tasks to win the hand of the princess. First, identify the king’s daughter in a crowd. The grateful bee flew around the princess, revealing her identity. Next, the man was to sort a mountain of seeds. The weaverbird helped him. He was told to devour an ox. The hyena happily came to his aid. Finally, the crocodile and his family formed a bridge so the man could cross the river and retrieve a magical feather. The man received riches and the hand of the princess, but his true reward was finding friends who repaid his selfless acts.